Imagine that Pontius Pilate had been interviewed by a newspaper reporter on Good Friday—right after he condemned Jesus to death (presuming, for a moment, that they had newspapers back then—which of course, they didn’t—you have to use your imagination here). If the reporter had asked him, “Why? 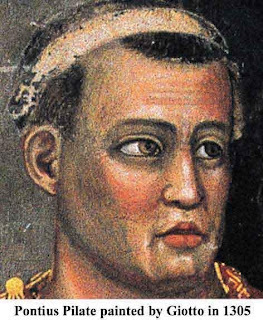 Why did you do it, Pilate? Why did you condemn Jesus of Nazareth to death, even though you knew that he was innocent of the charges they brought against him?” how do you think Pilate would have responded? Pontius Pilate, my brothers and sisters, was what we would call “a moral relativist.” A moral relativist is somebody who believes that, as the old saying goes, “everything is relative.” In other words, there’s nothing that’s always right; there’s nothing that’s always wrong; there’s no such thing as objective moral truth. For the relativist, right and wrong are determined by circumstances—or feelings—or personal preference—or some other subjective criterion. For the relativist, what’s right for one person might not be right for somebody else. And that, my brothers and sisters, is a prescription for conflict and disaster—in families and everywhere else in society—because it means that each person thinks that he or she should be able to live by his or her own rules. Can you imagine a family where everyone lived by their own rules? Can you imagine a country where everyone lived by their own rules? Well, you might not have to imagine it in the near future, because that kind of country—that kind of world—is fast becoming a reality. And it will become a reality unless we do something to stop it. A relativistic world is a very dangerous world—because, since there are no universal moral laws, evil people will very often go unpunished (sometimes they will even be rewarded), and good people will often be condemned. Unless you’re having a conversation with a mentally deranged individual, this should help the other person to see that there is at least one universal moral norm. And, of course, if there’s one universal moral norm, why can’t there be others? 2. Relativism leaves us with no criterion for moral decision-making but personal taste. So my message to you today is very simple: Learn to recognize relativism, and learn to resist it—to actively resist it! And teach your children and grandchildren and siblings and friends and co-workers to do the same thing, for their own sakes, and also for the survival of our country. The Andrea Hotel as it used to be. The Andrea after Hurricane Sandy. You might go to St. Pius X School or some other grade school in town; you might go to the middle school or the high school or a college or a graduate school—or your days in the classroom might be a far distant memory at this point in your life. It doesn’t matter. Two weeks ago we were all the same; two weeks ago, as residents of southern New England, we all attended the very same “academic institution”. None of us liked it, but that didn’t matter. We were forced to “attend classes” anyway! But that, my brothers and sisters, in the long run, wasn’t a totally bad thing. In fact, if we learn the lessons taught to us by our teacher, Sandy, and then put them into practice in our lives, they can actually bring us great blessings—both here and, even more importantly, in eternity. By now I’m sure you realize that the “Sandy” I’m referring to, who taught us at this “school,” is none other than the hurricane that we experienced on October 29th. Our community and many others along the east coast have certainly been “bowed down” in recent days. Let us look forward to being “raised up” in the not too distant future. But in the meantime we need to take advantage of the opportunity we have to grow from this tragic experience—especially in the spiritual dimension of our lives. St. Paul says in Romans 8: 28, “For those who love God, all things work together for good.” He doesn’t say that everything that happens to us in this life is good; but he does say that for those who love God all things (including the sufferings and tragedies and ‘Hurricane Sandys’ of our lives) can work for our ultimate spiritual benefit. They can make us better and stronger and holier, if we allow them to! So what are some of the lessons that we can take with us from our recent time in “Sandy’s School”? Well, lesson 1 should be obvious: We are not God! Some people in our modern world may “play God” by destroying innocent human life through abortion or other means; New Agers may think they’re divine; and some, like the scribes that Jesus refers to in today’s gospel, may want others to treat them like they’re divine—but there’s only one Lord! And he reigns forever, as we’re also told in today’s responsorial psalm. The second lesson follows from the first: Because we are not God, many things in this life are beyond our control—so our trust ultimately needs to be in the Lord, who can help us face and deal with the uncontrollable “Sandys” of this life (as he helped the widow of Zarephath in today’s first reading). Lesson number 3: Nothing in this life lasts forever, and we shouldn’t expect it to. As some of our teenagers put it at youth group the other night, “Worldly things are not eternal.” Well said. Which is why lesson 4 is so important: People are more valuable than things. The Book of Revelation says that when we die our good deeds accompany us into the Kingdom of God; it doesn’t say anything about our “stuff” coming with us! That’s because all our stuff stays here! We won’t get any prizes in heaven for our possessions here on earth, regardless of how wonderful they were. We will be rewarded, however, for our love of neighbor. So I guess you could say that lesson 4 has a second part: People are more valuable than things—so don’t get too attached to your stuff here on earth, because, sooner or later, you’ll have to let go of it. If a catastrophe like Sandy doesn’t cause that to happen, death certainly will. Lesson number 5 is one that we should all have learned as soon as the lights went out on the Monday of the storm: We need other people! Almost all of us needed Jack Carey and the people from National Grid to get us out of the darkness and back into the light, so to speak. Many of us needed assistance in other ways after the storm—and some of us still do! Tragedies like this make it clear that we are not—and are not meant to be—Lone Rangers in this life. We need our brothers and sisters. That’s why today’s gospel is so timely. Here we have a widow who gave what she could to help others. She gave in spite of her own poverty; she gave from her heart, out of love for God and neighbor. And her gift was pleasing to the Lord. 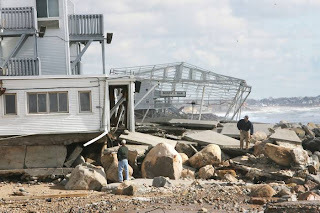 This woman was clearly “right” with God; which brings me to yet another lesson that we learn from Sandy—and especially from what Sandy did to so many beautiful buildings down at the beach. The lesson is: Get right with God NOW! Don’t put it off! In today’s second reading it says that we die once (which means there’s no reincarnation!) and after death we are judged. But that moment—that decisive moment—when we exit this life and meet the Lord face to face can come quickly and unexpectedly—as quickly and as unexpectedly as the end came for those homes and businesses on Atlantic Avenue the other day. So the bottom line is: If you’ve been thinking of going to confession and have been putting it off—stop putting it off! 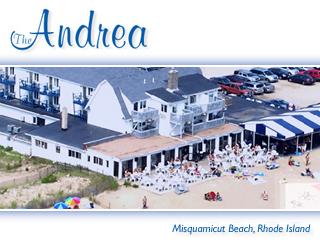 Think of the Andrea Hotel! Or Paddy’s. Or the Pleasant View Inn. Or one of the other places at our beach that was ruined. In today’s second reading we hear about Jesus’ once-for-all sacrifice, which has won for us the grace of eternal salvation. That grace is always available to us; all we need to do is reach out for it through faith and repentance. It’s always available to us because Jesus Christ doesn’t change like the New England weather changes! He doesn’t change like everything here on earth changes. He’s the same yesterday, today and forever. That’s why our relationship with him needs to be the most important relationship we have in this life. So there you have it, a few of the lessons that we can—and should—learn from our common experience in "Sandy’s School". In closing, I think it’s safe to say that we’ve all had teachers in our lives that we have liked a lot more than Sandy (I sure have! ), but popularity is not the ultimate measure of a teacher’s effectiveness. The effectiveness of a teacher is ultimately measured by how well that teacher conveys the truth to his or her students. Well, based on that criterion, I think we would have to say that Sandy was a very effective teacher for all of us, because she taught us some of life’s most important truths in a very powerful—and a very memorable—way! 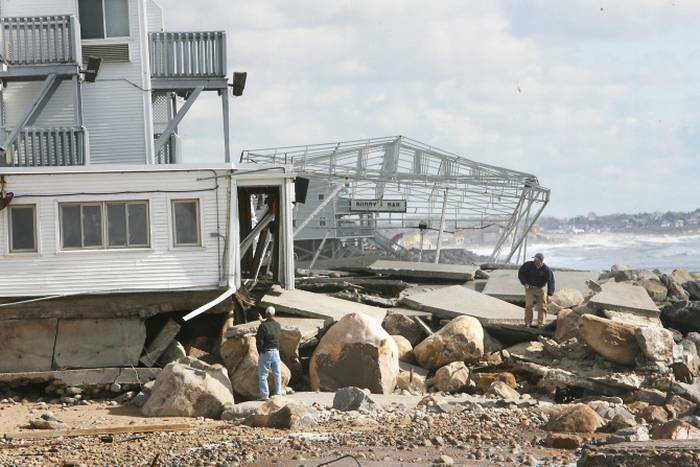 We didn’t suffer any major damage to our church and property during Hurricane Sandy. And, sure enough, it is! You don’t notice it from the front of the building, but you can see it if you look at the steeple from the side. Is your mezuzah crooked—like the cross on top of our church? You probably don’t have any mezuzahs in your home (although you might), but you certainly do have one in your heart. But it’s not enough to have a mezuzah. From a spiritual perspective, it’s very important that your mezuzah be straight and not crooked. It’s okay to have a crooked mezuzah in your house (if you do have one there), but not in your soul. Well, if you are, I will now do my best to un-confuse you! Ask your Jewish friends that question, and they’ll be happy to tell you that a mezuzah is a small, thin, tubular case (about the size of a container of lipstick). Some mezuzahs are made of wood; others are made of metal or some other sturdy material. Many of them are quite ornate, although they don’t have to be. They’re hung on the doorposts of Jewish homes—on the right side of the frame, near the top. 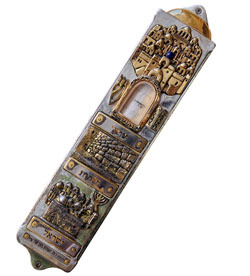 There’s a special prayer of blessing that you recite when you first put a mezuzah up. Obviously the Jews take that last line literally, which is why they put mezuzahs on the doorposts of their homes. When I was in Israel in the late 1990s, I remember seeing them all over the place—even in the hotels. And the Jews don’t just put them up and leave them there for ornamentation. When devout Jews pass through a door with a mezuzah on it, they touch the mezuzah, and then kiss the fingers that touched it—to express their love for God and to remind themselves of the commandment of God that’s inside: the command to love him with their whole heart and soul and mind and strength. It’s a very nice—and a very meaningful—religious practice. Mezuzahs are crooked because of a compromise. To me, that fact has great spiritual significance. I said at the beginning of my homily that, although we might not have any mezuzahs in our homes, each of us does have one in our heart. As Jesus reminds us in today’s gospel, the command to love God with all our heart and soul and mind and strength is still valid! It hasn’t changed. It applies to us as much as it has applied to the Israelites since the time of Moses. It is—and always will be—the first and the greatest commandment. Which means that it’s always supposed to be in our heart—in our “spiritual mezuzah,” so to speak. These two commandments, in other words, are supposed to be at the foundation of our life of faith. They’re supposed to guide us in every thought and word and action of our lives. They’re supposed to guide us at home, at work, in school—and even when we vote this coming Tuesday! In fact, that should be the bottom-line question for every Christian who goes to the polls on Election Day: Which candidates respect the law of God and the dignity of the human person the most? Love of God; love of neighbor. Of course, the sad reality is that we don’t allow these two commandments to guide us all the time. Because we’re sinners, we all compromise our beliefs in various ways (like those rabbis compromised their beliefs), and our spiritual mezuzahs end up ‘crooked’—just like those mezuzahs on the doors of Jewish homes are crooked. 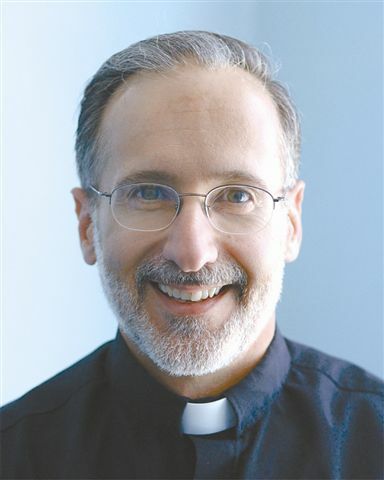 That’s why I said at the beginning of my homily that it’s really important that we try to keep our spiritual mezuzahs straight, and, when we don’t keep them straight and they do get crooked, we need to get them straightened out as quickly as possible through repentance. Which, of course, is precisely what the sacrament of Confession is for. So the next time you visit a Jewish friend and see a mezuzah on his doorpost, think of yourself. Think of your life. Remember the two commandments of Jesus, to love God above all things and your neighbor as yourself. And, as you look at that crooked container, think of the many ways that you have failed to live those commandments. Then ask the Lord to straighten you out! And, of course, if you make a good confession afterward—the good news is, he will! When you hear the word “saint,” what thoughts and images come to mind? Do you think of someone who’s strong and happy and wise, or do you think of a person who’s weak and melancholy and naïve? Today we celebrate the feast of All Saints—a day in which we are reminded that we are all called to sanctity. St. John tells us in our second reading that “we are God’s children now.” His implication there is that we are to LIVE in accord with this identity. In other words, we are to live as God’s children now—in this life—by being holy, and by putting into practice the Beatitudes that we heard in today’s gospel text from Matthew 5. That is to say, we will be saints! And this is not optional! Indeed being a saint can’t be optional, since at the end of time there will be only two groups of people: the redeemed and the damned; the saints of heaven and the condemned souls of hell! So it’s very important that we “strive for that holiness . . . without which no one can see the Lord,” as the author of Hebrews tells us in chapter 12 of his letter. But many people don’t do this—they don’t actively pursue holiness—because they have a number of misconceptions about the saints (especially those saints who are officially canonized by the Church). Which is why I asked that question that I asked at the beginning of my homily: When you hear the word “saint,” what thoughts and images come to mind? The other day I made a list of some of the common misconceptions about the saints that I’ve encountered over the years. I ask you, have you ever believed any of these things in the past? Do you believe any of them now? The saints said yes to everybody; they never offended anyone by saying no. The saints didn’t care at all about this world; all they cared about was heaven. The saints were not practical people; their heads were always “in the clouds,” so to speak. The saints didn’t experience temptation like ordinary people do. The saints were all celibate. The saints never had any fun. The saints prayed all day. All the saints started off as good, holy people. The saints never got discouraged or depressed. The saints allowed people to walk all over them: they had no backbone. The saints never thought about or talked about anything or anyone but God. The saints loved people less because they loved God more. The saints got along with everybody; they never had conflicts with other people like ordinary men and women do. The saints were all perfect and sinless, like the Blessed Mother was perfect and sinless. The great saints of the Church did not say yes to everybody. Because they were men and women of such strong conviction, they often said no—especially to sin! And they offended some people in the process. The saints were tempted just like the rest of us are. The saints sometimes got discouraged and depressed (just think of the prophet Jeremiah and how discouraged he got because of all he was forced to go through). Many of the saints were married people. The saints knew how to enjoy life. In fact you could make the case that saints have much more fun than worldly people do, since they know how to properly enjoy the good things of this world. They don’t abuse them. The saints didn’t love their families and friends less because they loved God more. In truth it was exactly the opposite: because they loved God so much, they were able to love the other people in their lives more completely. And that includes their enemies. If you’ve read St. Paul’s letters and the Acts of the Apostles, you know that the saints didn’t always start off as holy people. St. Paul certainly didn’t! And even after their conversions they didn’t always get along with others—which means that they weren’t perfect and sinless, like our Blessed Mother was perfect and sinless. I mention all this today because, if you believe any of these 15 falsehoods that I’ve outlined in this homily (or any others that I didn’t mention), you will probably think that being a saint is impossible. And, of course, if you think it’s impossible to be a saint, you won’t actively pursue the holiness necessary to be one. Which will put you in grave danger of losing your soul! And that includes being a saint—even if we’ve been very un-saintly in the past. May God help us to believe that—and to live like we believe that—so that someday the possibility of being a saint will become a reality for us all.